As most of you know, I visit many different places on Jordan Lake. For the first time in a long while, yesterday I found myself at the dam. The sun was wintery, and as usual at the dam, the wind was howling and it was cold, cold. I sat down on the top of the riprap, half way between the dam and the end of the riprap. going any further down river just chases the eagles further away. Winter seems to stir eagles up and push them all over the lake. Go to your closest boat ramp and look! This 2 year old bald eagle appeared over my head and did a couple of what I call “sky jinks”. He turned himself inside out, all mid-air, and then was gone over the horizon. 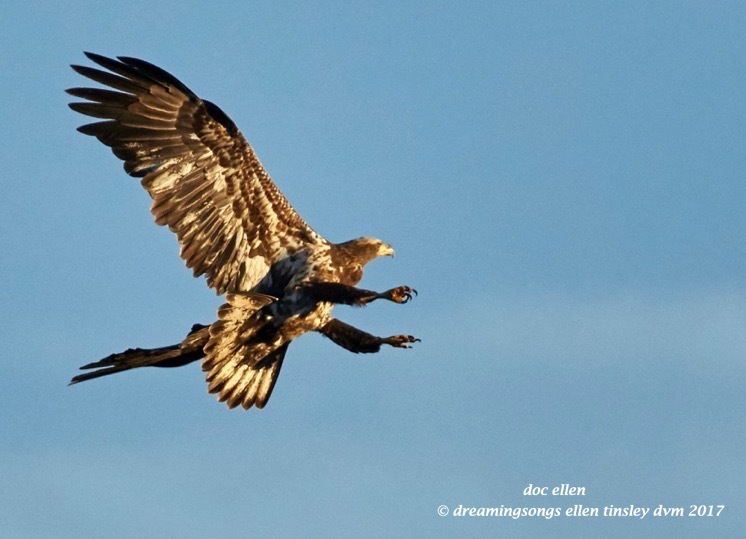 Posted in birds, Eagles of Jordan Lake, Jordan Lake, Jordan Lake State Park, photography, raptors, wild birds and tagged as American bald eagle, bald eagle, bald eagle flight, bald eagles of Jordan Lake, Chatham county, immature bald eagle, immature eagle, Jordan Lake, Jordan Lake State Park, raptor.